Hoppo Bumpo: Where did you come from? Found in the park. My own little treasure. 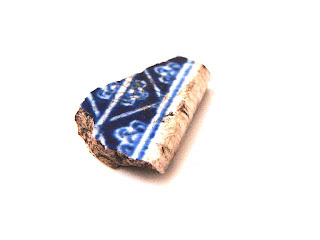 A tiny piece of ceramic. Blue and white glaze on both sides. The print looks like it could be Vietnamese. I don't know but it wins hands down over the plain brown 1 kilo rock that my son adopted as his pet rock on holiday at Christmas. At least yours can be carried home from the family picnic in your pocket! ooo I wonder too - it looks pretty though - I like the blue.